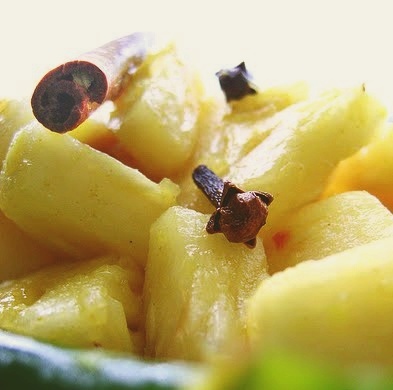 Pineapple chunks (Pacri Nenas). A popular side dish that is usually served with specialty rice meal such as Nasi Minyak or Nasi Tomato. Pacri Nenas is a good combination dish to blend with at malay weddings and festives. Remove the pineapple skin, slice into rings and remove the core. Boil the pineapple with tumeric powder for about 5 minutes. Drain the pineapple slices and put aside. Add a pinch of curry powder, cloves, cinnamon stick, star anise and cardamon until fragrant. Pour in 1/2 cups of water (adding water is optional as the pineapple juice will appear by itself). When boiling, add the salt, sugar and vinegar to taste. Serve hot with nasi minyak or briyani rice.